Tag Archive | "Harlequin Rasbora (Rasbora heteromorpha)"
The Harlequin Rasbora (Rasbora heteromorpha) is an extremely desirable aquarium fish and no doubt the best known of all the rasboras. 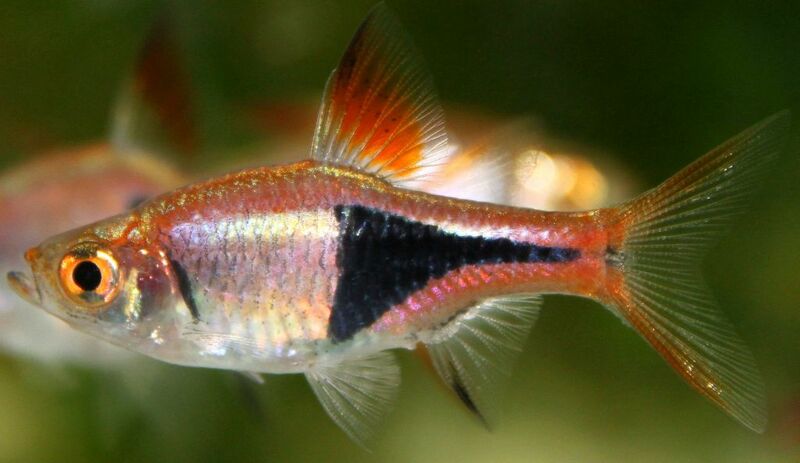 Harlequin Rasboras belong to the Cyprinidae family of carps and was originally given the scientific name Rasbora heteromorpha but is now known to tropical fish keeping enthusiasts as Trigonostigma heteromorpha, or the harlequin fish. They are sometimes confused with Trigonostigma espei and Trigonostigma hengeli which are more slender and have a broader “lamb chop” like black stripe that tapers towards their caudal peduncle. The Harlequin Rasbora is native to southern Thailand, Malaysia, Singapore and Sumatra where they are found in the peat swamp forests where the slow moving blackwaters have a low mineral content and high concentrations of dissolved humic acids. Harlequin Rasboras are easily identified by their lustrous coppery orange bodies and the characteristic black triangular “pork chop” shaped patch that runs from mid body and comes to a point at the base of the caudal fin. Female Harlequin Rasboras are larger than the males. The “pork chop” like patch is females is straighter than the more rounded patch and extended tip of the black line that distinguishes the males. The Harlequin rasbora is an active, peaceful, shoaling fish and should be kept in groups of at least six individuals. Harlequin rasboras are perfect for a community aquarium setup with other peaceful, similarly sized fish. They get along well with many of the small characins from South America like small barbs, danios, other small rasboras, Corydoras catfishes, Otocinclus catfishes, etc. Harlequin rasboras do best in an established, densely planted aquarium with subdued lighting and plenty of open swimming areas with at least 8 to 10 individuals. Plants such as various species of Cryptocoryne or some Asiatic species of Aponogeton should be used but other bushy plants like Cabomba can be used provided there are places for the rasboras to hide from the intense lighting needed to grow the plant. A piece of driftwood or some driftwood roots is perfect for this and will tend to buffer the tank water. Tank filtration should provide a modest current with just enough turnover to maintain aquarium cleanliness. Unlike other rasboras that are egg-scattering spawners, the Harlequin rasbora deposits adhesive eggs on the underside broad leaved plants such as Cryptocoryne and Aponogeton . A shallow, warm (82.4 °F), acidic, soft water breeding tank with broad leaved plants should be set up for breeding. To induce spawning, provide a young 9 to 12 months old female Harlequin Rasbora with a two year old male, and feed them live food such as daphnia or mosquito larvae. When ready to spawn, the female will swim in an inverted position under a broad leaf and rub her belly on it to prepare an area for spawning. The male will join the female and as the eggs are deposited on the underside of the leaf, the male will curl his tail around the body of the female and fertilize the eggs. Normally 6 to 12 eggs at a time are deposited in this manner until spawning is completed, usually over a period of a couple of hours. The total amount of eggs deposited during a spawn will vary from 80 to as many as 300. After spawning, remove the parents and keep the breeding tank dark until the eggs hatch (18 – 24 hours). The three to four millimeters long fry are translucent and will remain attached to the leaf that the eggs were laid on for a another 12 to 24 hours, until the yolk sacs are absorbed. When the fry are free swimming, feed them live infusoria for the next 7 to 14 days. They can they be fed newly hatched brine shrimp and finely crushed flake food until fully grown, usually in 8 to 10 weeks. The Harlequin Rasbora is an omnivore and does well on a diet of prepared flake food, frozen or freeze-dried bloodworms and tubifex . The approximate size when available for purchase us usually 1/2″ to 1″ in length.